On Thursday, by 11 am, Mannu was at Pushp Bhawan gate. It was the second conciliation hearing of his case. He climbed a floor up the staircase, and joined the queue in front of the Assistant Labour Commissioner office. More people came up slowly, cutting through the queue to trace where their names and turns figured on the cause list. Mannu’s case against Ikai, a textile designer store where he had worked for four years, was eighth that day in a list of 51. Fashion, media studies, hotels, several other establishments were on the lists. It was getting crowded but the queues also moved up quickly. One by one the names were called out. Very quickly each person came out. In each case, the employers had not turned up. The worker who was had complained was assigned by the conciliation office to come at a date a month from that day. After another at least 45 days passed this way in dates, the labour conciliation office would consider sending the case ahead to a labour court in Dwarka. A middle-aged trade unionist, was also there. He had come there as office routine. Several of the Okhla industrial case landed at Pushp Bhawan. He consulted a man who had worked in a paints factory and filed a case against the firm for not paying minimum wages. Then he came towards Mannu and enquired into the case status. He took the papers Mannu had in his hand and looked at them. The application had been written by the unionist’s boss, the district head, a medical doctor who met both patients and retrenched workers at his evening clinic. He asked a few questions from Mannu, when had he put in the request, was the last hearing last month. Soon, the labour commissioner’s assistant called out. Mannu made his way with ease, he knew the space and the routine so well by now. It moved even more quickly now. The tall labour official who towered over everyone even while he was seated did not look up even once at who had come in. There were three empty chairs in front of him. His assistant, a woman to his right of the desk, looked up. After confirming no one had turned up from the company for reconciliation with the worker, she quickly scribbled a next date, “11 June, next month now,”, she said, passing the paper she had scribbled on to Mannu to sign on and accept the next date. Mannu was out of there in less than a minute. It is better when I go outside the factory gate last three days with a cardboard protest. Here at least 3-4 workers stop by and ask what happened, my former colleagues come and shake hands with me when they see me there. India’s growth story of the last two decades has had one recurring theme: that the pattern of economic growth is accentuating insecurities. Yet, there continues to be a deep divide over whether the gains from growth ought to be ploughed to achieve social security for everyone. Social security has come to be linked to job benefits, trying it to one’s status as a worker in the formal or the informal economy when, fundamentally, it originates from the notion of ensuring everyone protection against vulnerability and deprivation. In the Constitution, Directive Principles Article 41 asks the State to “within the limits of its economic capacity and development, make effective provision for securing the right to work, to education and to public assistance in cases of unemployment, old age, sickness and disablement, and in other cases of undeserved want.” Article 42 says the State shall make provisions for securing just and humane conditions of work and for maternity benefits. India does not yet explicitly recognise a national minimum social security cover. In recent years, including with an intervention by the Supreme Court in the Right to Food case, the government moved forward to providing nutrition, and beginning 2006, employment support to the poor through MNREGA. Economists Amartya Sen and Jean Drèze distinguish two aspects of social security – “protection” and “promotion”. While the former denotes protection again a fall in living standards and living conditions through ill health, accidents, the latter focuses on enhances living conditions, helping everyone overcome persistent capabilities deprivation. A close look at India’s record in providing social security shows that while only a fraction of citizens enjoy any “protection” at all, these are being further eroded with the current pattern of economic growth. Among provisions aimed at “promotion”, social security through nutrition, work entitlements for all, are threatened with fund cuts and further shrinking. In 2011, in an affidavit to the Supreme Court on the official poverty line, the Planning Commission estimated that based on the Tendulkar Committee report 30 percent of the population live below the official poverty line. Several debates followed on how the poverty line ought to be defined. But what has remained absent from both public discourse and laws is a more crucial question: how do these 35 crores people on survive Rs 32 per person per day in urban areas and Rs 26 per person per day in rural areas? What do they do in contingencies of health, illness, old age, and death, and how do they protect themselves from slipping into further poverty? The government launched the first pensions program for the poor, the National Social Assistance Program, starting with of a pension Rs 75 per month, in 1995. Under the Indira Gandhi Old Age Pension Scheme and Widow Pension Scheme, the central government contributes Rs 200 and Rs 300 per month respectively. Several states, Himachal Pradesh, Rajasthan, Bihar provide between Rs 400-300 per month. Tamil Nadu provides Rs 1,000 per month. A recent survey, which included pensions, found the leakages to be small, and found encouraging evidence that the scheme is reaching its intended beneficiaries. The Public Evaluation of Entitlement Programmes(PEEP) survey in 2013 by researchers at the Indian Institute of Technology (Delhi) recorded that among nearly 900 rural respondents selected at random from the official pension lists in ten states, 97 per cent were getting their pension and recorded only one case of “duplicate” pension i.e. one elderly person getting two pensions. Majority of beneficiaries, 76 percent, however, said they received pensions in their post office and bank accounts after delays of over a month. Thus, while the pension amounts are meagre, they are crucial in supplementing the elderly’s ability to afford medicines, food, and other necessities. The biggest gap, and one which may only widen, is in social protection for the working poor. The UPA government appointed the National Commission for Enterprises in the Unorganized Sector (NCEUS) in 2004 to look into livelihood conditions and social security for unorganized workers – employed in the unorganized sector and those in the formal sector without any social protection. It found that only those in the formal sector, 8 percent of India’s workforce, enjoys social security. Over 91 percent of workers, over 39.5 crore workers, are in the informal sector. The Commission highlighted that there had been almost no growth in formal employment since early 1990s and almost all growth in employment was in the unorganized sector. NCEUS’ finding that 79 percent of workers in unorganized sector lived on an income of less than Rs 20 a day made it evident that the gains of growth were bypassing the majority of the working population. NCEUS proposed legislation for a national minimum security package for unorganized sector workers, social insurance, social assistance for life and health cover, old age benefits to all workers within a period of five years financed by the Centre and state governments, employers (where identifiable) and workers at a cost of less than 0.5 percent of Gross Domestic Product after five years. The UPA discarded the Commission’s recommendations for statutory backing to social protection. “NCEUS suggested a National Fund for this and a notional Rs 1500 crores was set up. It proposed that National and State Social Security Advisory Boards were to be created but only 14 states set these up,” says a senior government official. India spends 1.4 percent of its GDP on social protection, among the lowest in Asia, far lower than China, Sri Lanka, Thailand, and even Nepal (5.4, 3.2, 3.6, 2.1 percent, respectively). The NDA government has not yet indicated any support to the idea of legally guaranteed social protection for all workers. Officials say the government is proposing to issue a smart card, “U-WIN”, Unorganized Sector Identification Number, to every worker in the unorganized sector with a unique identification number for accessing social schemes. What these benefits will be, and what their legal guarantee is uncertain. Today I called Diwakar two months since I got a new Ranchi number and he said Ganesh Ram died. He had a fever and he died. He said he was not able to tell me because the last number I gave him, the SIM that I lost in November, did not work even after all the times he had tried. Ganesh Ram wanted to write stories for the movies. We first met last June in the circuit house in Sundarbani in Jammu. He and Navin Ram had managed to slip out of the OMS eent bhatta when the jamadar Raju wasn’t looking. Ganesh Ram was the only one in the bhatta with a phone. The jamadaar was already wary of him and his attempts to become a “leader” but he had managed to leave for a few minutes to talk. “I spoke to two film-makers but they say they are not interested because I cannot offer them money”. I doubted if i could include that in what I file. I noted down the details of their debt to various kiln-owners since their childhood, details of the number and debt in the four other families who worked with them, directions for the bhatta 10 kms from the circuit house so I could reach on my own the next day. Then I took photos of Ganesh Ram and Navin Kumar – who was much quieter – inside the circuit house balcony and outside (outdoor profile photos in case the bhatta owner did not like me using my camera at his kiln). We went to a shop nearby for a quick rajma chawal lunch. Then both of them left to get back to work. I was not sure how much it had been a choice for me to come there. For weeks after he got my number from Diwakar whom I had met in Janjgir Champa when I had gone there to interview his nearby village people had returned from kilns and construction sites, Ganesh Ram had unfailing called every second day at an unearthly 7 am. Ganesh Ram and Navin Kumar did get back to Chattisgarh that month. They managed to leave with ‘release certificates’ after I met the Rajouri District Collector Sougat Biswas and he intervened. 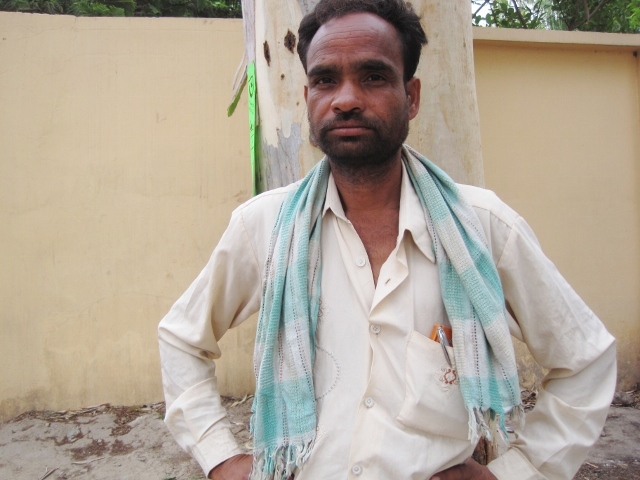 But back in his village in Chhattisgarh, Ganesh Ram got no assistance to realise the claims the ‘release certificate’. In December, Ganesh Ram caught a fever and died. No assistance had arrived by then. Thirty spokes converge at the wheel’s hub, to a hole that allows it to turn. Clay is shaped into a vessel, to enclose an empti­ness that can be filled. Doors and windows are cut into walls, to provide access to their protection. Though we can only work with what is there, use comes from what is not there.